An Executive Assistant at an industrial products company was given a tight deadline to find a place to hold a meeting for Regional Business Development Managers, Sales Directors, and the VP of Sales and Marketing. The company is based in Indianapolis, and the BDM’s are located all over the country. Easy travel schedules, and the ability to schedule everyone quickly were primary concerns. Employees would arrive on Monday, with an off-site team dinner planned within walking distance of the hotel. Tuesday would be an all day meeting, and Wednesday was scheduled for two small meetings followed by box lunches. A manufacturer of medical devices planned to hold an annual meeting for their North American sales representatives. The meeting would be attended by 95 people. The goal was to find a luxury hotel in downtown Miami, where they could host all functions under one roof. There would be a small senior management meeting on Tuesday, an off-site team building activity on Wednesday, and small breakout rooms for regional meetings on Thursday morning. Thursday afternoon would require a general session space for 95 people, as well as 10 exhibit areas to showcase company products. This group selected the EPIC Miami. Annual gathering of approximately 200 members of an industry alliance. Participants consist of 11 Board Members, and the key owners and managers of businesses within the industry. They meet every year in May, and choose a different location each time, based on which member volunteers to be the conference host. In 2017, the group planned to meet in St. Louis, Missouri. The room block consisted of 11 rooms on a Monday, for the Board Members, and 175 rooms on Tuesday and Wednesday. Meeting space was to be scheduled all day Tuesday and Wednesday, with half day meeting on Thursday. The client expressed a particular desire for a unique hotel, with character and a sense of place. They also had a budget of $169 per night. This group selected the Magnolia Hotel St. Louis. Pacific Northwest based manufacturer of electronic computer parts planned to hold a meeting for sales staff, and award winners of their incentive plan. They were expecting 80 employees to participate and wanted to hold the meeting in a warm weather destination during January. It was important to the client that the destination provide a variety of activities and attractions to entertain the participants while they were in town. The company also stated they needed to work with a budget of no more than $150 per night. Lastly, they had flexibility to hold the meeting on one of two different dates. VenueQuest sourced hotels in San Diego, Newport Beach, Long Beach, Las Vegas, Scottsdale and San Antonio. 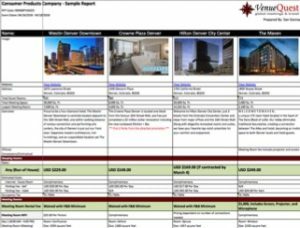 The report for the customer compared the costs of multiple potential dates and multiple potential locations.